Recently, shocking news broke: there is a major vaccine scandal underway in China. In some circles, vaccines have become controversial in recent years, but the situation that is unfolding now in China is beyond controversial; in fact, it is actually a human rights violation and a public health catastrophe. When you receive a vaccination--or any medication, really--you expect that the item contains what it is supposed to. You assume that the box or container is properly and accurately labeled, and that the substance inside is as described. You trust that what you are receiving is the medication that you are intending to take, and ideally it will have the power to improve your health or to protect you against diseases. Most of all, as a parent, you do everything you can to keep your children alive and well. The thought of infants and babies receiving false drugs or vaccines is truly horrifying and should not be something we face as humans. But what happens when that is not the case? What happens when big drug manufacturers are exposed in a lie, and the vaccines people received are proven to be falsely labeled? Not only does this endanger thousands of people, it defies the very foundations of trust that modern societies are built upon. Read on to learn more about what’s going on in China, and why Americans may be at risk, too. Unfortunately, this rabies vaccines issue is simply the latest in a series of public health scandals relating to vaccines in China. Another related story that broke in recent weeks relates to the vaccines that babies are given upon birth and throughout the first several years of childhood. It was recently revealed that in China, drug and vaccine companies had been giving fake vaccines to these infants. The vaccines that were being administered, when tested, turned out not to really be the vaccines they were supposed to be. To vaccinate children improperly and unsafely in this manner is a serious charge. 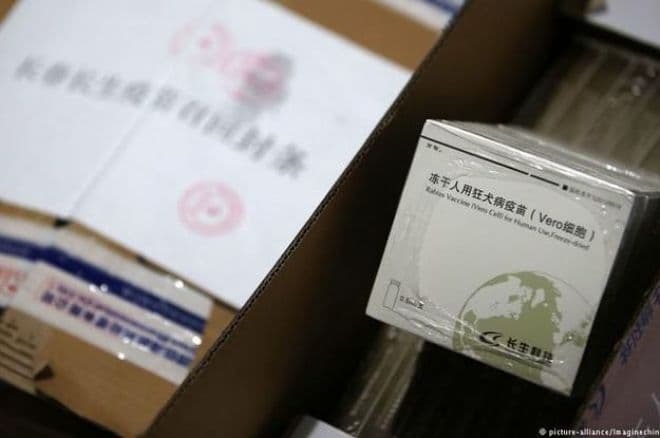 According to Caixin Global, “Only 5% of vaccine batches are checked for effectiveness to avoid delaying the approval process and eating into the time before each batch’s expiration date.” This may explain how a major crisis like this could slip through the cracks for so long. Worst of all, in China, “Substandard vaccines are legally considered ‘inferior drugs,’ not ‘counterfeit drugs,’ and producing inferior drugs that have not been proved to seriously harm human health is not in itself enough justification for imprisonment under Chinese law.” This helps to explain how and why such a situation could have happened in the first place. The Wall Street Journal reports, “Last November officials in Jilin province found that the Changsheng Biotechnology Co. falsified production data for a diphtheria, pertussis and tetanus (DPT) vaccine. After national regulators found similar problems with Changsheng’s rabies vaccines this month, the provincial government revealed that problems with the DPT vaccine affected more than 250,000 doses. … Chinese are particularly angry because similar cases have happened in recent years, followed by similar promises to crack down. In 2010 and 2013 hundreds of children were hospitalized and several died from faulty vaccines.” Because of the nature of these charges, addressing them promptly is of critical importance. How will this affect the rest of the world? With China posed as a global superpower, it’s no surprise that a crisis like this could have repercussions around the globe. Perhaps the place that is most directly and noticeably affected is neighboring province Hong Kong, where major public fear and concern has broken out in response to the situation in China. For example, in Hong Kong, citizens are worried that the mainland Chinese are now going to import a large amount of vaccines or even cross over to Hong Kong to get themselves and their children vaccinated. While this may be an effective approach for mainland Chinese people, it positions the people of Hong Kong in a potentially hazardous spot: there is fear that China’s vaccine scandal could result in a vaccine shortage in Hong Kong. Depending on where Chinese citizens choose to attempt to import vaccinations from, other areas could be affected as well. Due to the possibility of exceedingly high demand pouring forth in the coming months and leading to fewer vaccines available for all, many parents in Hong Kong are now rushing to get their babies vaccinated before the potential shortage catches up with the market. Of course this, in turn, could make the possibility of an impending shortage even stronger. If vaccines were to be in short supply, preventing babies from getting the basic protections they need, it’s possible that this could even become an epidemic. Still, it seems that a full-on shortage is still a ways off, at least for now. Supply levels are currently stable and authorities in the area predict that the market will correct itself and that the economy will be prepared to handle any increase in demand. Still, the area is monitoring the situation closely. Some even predict that Hong Kong will see a surge in medical tourism for this very reason. While this idea may come as a boost to Hong Kong’s economy, most citizens of Hong Kong are far more concerned about being able to care for their children and families without having to fret about a lack of available vaccines against preventable diseases. Believe it or not, it’s not just Chinese citizens who are in danger when it comes to the world of vaccinations. Americans face dangers of their own as well--and should take note to ensure that a situation like this does not occur at home, too. For one, it’s important for Americans to be aware that, like Hong Kong, we could feel the effects of another country’s problem by being faced with the possibility of drug and vaccine shortages in other countries. If this same situation were to repeat itself in, say, Mexico or Canada, the United States as the closest country with safe vaccines would feel the impact. Americans should not assume they are immune to catastrophes like the one occurring in China, despite the regulations and protections in place. Knowing that things like this are happening today in the world, Americans must ensure that proper policies and procedures are being enforced so that situations like this do not replicate themselves in the United States. Supporting the use of random inspections--such as the one that revealed the rabies vaccines scandal in China--is also not a bad idea. Vaccine problems occur around the world. In Canada, one woman shares her story of being denied rabies vaccines despite requesting it repeatedly. One issue here is that Fraser Health has released the vaccine for victims of raccoon attacks before, most notably for a former mayor, who said that she was recommended to take the vaccine as a precaution. Jurik, who is not a public official, says she is being denied rabies vaccines because there are no reports of rabies-infected raccoons in the area. However, with a disease like rabies, most people would feel the same way that Jurik does: it’s much better to be safe than sorry. Still, despite her efforts, her requests and demands for the vaccine are being denied. Rabies “has an alarmingly high mortality rate in those who do get infected but don’t get treated in time … Unfortunately, once a person starts experiencing symptoms of rabies, they’re almost guaranteed to die from the infection.” The main danger of contracting rabies is the fact that once symptoms present themselves in a human, he or she will almost always die from it. That’s why it’s vitally important to get rabies vaccines as soon as possible after coming into possible contact with the virus. Symptoms may take weeks or even years to present themselves, and few people who have had rabies have lived through it. In the few cases where a human did survive rabies, it’s because they were put into a coma; later, they had to learn to walk and talk again. Another situation that is similar to China’s is currently under investigation in America. Whistleblowing former virologists at Merck, a pharmaceutical giant, claim that they “witnessed firsthand the improper testing and data falsification in which Merck engaged to artificially inflate the (MMR) vaccine’s efficacy findings,” according to Health Impact News. Making matters worse, the parents of a 21-year-old woman named Christina Richelle Tarsell are claiming that their daughter died after receiving Merck’s Gardasil vaccine. These claims and statistics about vaccines and the shady drug makers profiting off of them are alarming. However, no matter what country is involved in the most recent scandal making headlines, the bottom line is the same: citizens need to be able to trust their country and the manufacturers producing the substances that could save or harm their very lives. At times, they may turn to importing vaccines from other, more reliably regulated countries. But no matter what the case, each person must do his or her own in-depth research. Patients should speak to their doctors at length about the source, origin, and intention of any vaccine or medication. Doing at-home research can be helpful, too; for example, it wouldn’t take many Google searches to figure out that Merck has been involved in previous scandal, so in some cases it may be preferable to look for another manufacturer. There are sometimes risks involved with vaccines, but usually the alternative is even more risky. No matter what, patients should approach vaccines on a case-by-case basis with the awareness that there have been scandals in the past but also the awareness that vaccines have saved or protected billions of lives. Doing ample research and only moving forward with what feels comfortable for you and your situation is the best way to approach the issue. Wondering how to stay safe and protect yourself from the risks of vaccine scandals? One way is to check for recent vaccine recalls on whatever vaccines you may be needing. For example, Lot # 201605014-01 produced by Changchun Changsheng Biotechnology Co., Ltd. and Lot # 201607050-2 produced by Wuhan Biological Products Research Institute Co., Ltd. were both recently recalled. Other recommendations for keeping the vaccine sector safe for consumers includes supporting fair competition among vaccine firms and encouraging supervisors to get professional training. When reviewing the vaccination checklist your child must receive before heading back to school, you may be feeling doubtful about whether these vaccines can really be trusted. This vaccination schedule in America is one of the things that works about the American system, and it is put in place for the protection of the people. effective vaccine supply in its history.” If you want to learn more and be a discerning consumer, check out the CDC’s pamphlet on Ensuring the Safety of Vaccines in the United States, which discusses items like clinical trials, monitoring vaccine licensing, learning about the development of a vaccine, and understanding vaccine manufacturing. Refer to this document for some pre-vaccination steps you can take to put your mind at rest and do due diligence and plenty of research before agreeing to the vaccine. You can also refer to this pre-immunization checklist from Australia’s BetterHealth.